Have you ever dealt with a child who wets the bed? We are dealing with the issue of bedwetting right now, and I gotta tell you it is stressful. Our oldest child has trouble staying dry all night. We had him in pull ups at night until this summer when we decided to give it a go and take off the pull ups. We would take him pee at night right before we went to bed and he would stay dry the rest of the night. He was waking up very early because he had to wake up and pee and then couldn’t go back to sleep–but we thought it was great that he was waking up to go. Then we moved to England. Once we arrived in Enlgand everything started off fine. Until school started. Our oldest is in public school and the adjustment of going to school for 6 hours a day and being very tired by the end of the day made bedwetting a bigger issue. He was wetting the bed two times a night most nights. We armed oursevled with washable puddle pads that we put over his flat sheet so that if he did have an accident we could take that off and replace it with a fresh one. That way we weren’t having to change sheets in the middle of the night. We take him pee before we go to bed sometime between 10 and 12. We usually try to aim for 10:30 because the chances of him having an accident after 10:30 increase by the minute. If we are too late then we change jammies, change the puddle pad and have him empty his bladder. Occasionally, depending on how he is sleeping the accident may get on his comforter, sheets, or blankie. Throw those into the kitchen where the washer is so they can be washed the next morning. Sometime between 2am and 4:30, whichever parent wakes up first, will take him pee again. Occasionally we are too late and we have to repeat the above step. Rejoice in the morning if he stayed dry all night (and I have no more laundry to do). Now, this may not be the BEST way to handle bedwetting at night but it works for us for now. I don’t enjoy having interrupted sleep in the middle of the night and dealing with taking him to the toilet but I dislike even more dealing with wet jammies and extra loads of laundry. A few weeks ago I was getting concerned that maybe there was something else going on with him–a medical problem. I started doing some research (talking to other parents and reading on the web) about bedwetting in school age children. It is common for boys especially to struggle with bedwetting. Some children don’t produce the hormone that supresses the body from making urine at night until they are older. In some cases, not until puberty. It isn’t their fault. They aren’t doing it on purpose. They can’t help it. They aren’t lazy. Using things like sticker charts won’t really be helpful because bedwetting is not something that children can control. It isn’t the same thing as using a sticker chart for thumb sucking or doing chores. Use empathy and love when your children have an accident. Use all your might to not show any anger toward your child if they have an accident. If you suspect a medical problem, take the child in for a check up and talk to the pediatrician. Some websites said that taking them to the toilet at night doesn’t really teach the child anything–it more trains the parent than anything else. If your child is old enough for sleepovers you can ask your doctor about a prescription the child can take to not wet the bed. Or teach your child how to discreetly use pull ups to avoid being embarrassed about needing them at night. Take heart, you aren’t the only parent out there dealing with extra laundry due to bedwetting! How have you dealt with bedwetting? What has worked for you? My philosophy on most developmental milestones is, “wait until they’re ready and it’ll be a whole lot easier.” I have not always had this philosophy, but I’ve learned that racing to the next stage too early is very frustrating for me and for my child. One of my friends wisely told me that there are two things you can’t force a child to do. You can’t make them eat and you can’t make them use the potty. Children will learn very fast that they have complete control over those two things and the power struggle is inevitable if you push too hard. We have been doing a lot of potty exposure in my house. My first child has special needs and went through a period where we thought she was ready to be potty trained, but she isn’t, so we are still exposing her hopeful that she’ll start being ready soon. However, through all of this exposure, my two year old son has become very interested in the potty. It got to the point where he would go pee whenever I put him on the potty. I decided that it was time to say goodbye to diapers. We woke up one morning, I showed him his brand new Thomas the Train underwear and told him that he was a big boy and he was going to keep his undies dry by using the toilet whenever he needed to go potty. Every 30 minutes I took him to the potty and he did his thing proudly. He was motivated to use the potty with the promise of washing his hands when he was done. We are now about a week and a half of being accident free at home. Sometimes he does not want to go when I tell him it’s time to use the potty, but I gently explain to him he can continue his activity once he goes potty. He has been very compliant. He still needs to learn how to poop in the toilet and I am hoping he will begin to tell me when he needs to go instead of needing reminders. I am also going to get over my fear of accidents in public and start keeping him in his underwear when we leave the house. Potty training my son so far has been a very easy feat. I really believe that it is because he was emotionally, physically, and behaviorally ready for this milestone and it was never something that was forced on him. It sure feels good to only have 2 of my 3 children in diapers! I am hoping that he will rub off on his big sister and she will start showing an interest in becoming potty trained. Do you have a more laid back approach like I do or do you have a different approach? How have you encouraged pooping in the potty and spontaneous potty usage instead of needing reminders? Are you afraid of public accidents like I am? Cloth diapering keeps disposable diapers out of landfills and it can save money, so I decided to cloth diaper my second child. Amelia has written about the benefits of cloth diapers before and I always wanted to try it. My problem with getting started cloth diapering was spending the time researching what to buy and spending the money on them. You can’t exactly just walk into a Babies R Us and buy everything you need. I spent a lot of time figuring out the different types of diapers and where to buy them. There are prefolds and covers, all-in-ones, fitteds with covers, pocket diapers, and so much more. I made my list and added up how much everything was going to cost and put it in our budget. However, every month something would come up and it got moved the bottom of the priority list. Then a lady at church heard I wanted to cloth diaper and very generously gave me a gift of prefolds, fitteds, Thirsties covers, Y-straps, and two wet bags. I also gave her forty bucks to “round out my stash.” She used diaperswappers.com to buy everything I needed. I am very thankful that I didn’t have to spend the time and energy to get everything while I was more focused on having my baby. After getting breastfeeding established with my son I decided to tackle cloth diapering and learn this new skill. We quickly learned that you need to be sure to tuck the all of the prefold diaper under the cover, so they won’t wick out on to his clothes. Also, it is helpful to be organized and set up a station. I bought two dollar store trash cans. One is for the cloth diapers and the other is for wipes and other trash. I only had a few blow outs of poo or sometimes the pee would seep through the cover onto his onesie. I am not very good at changing his diaper very often so I use 2 prefolds inside the cover. Traveling with cloth diapers is fine as long I am sure to bring everything I need – extra diaper cover, extra prefolds, and my wet bag for dirty diapers. They take up more room in a diaper bag than disposables. Once I figured out how to fold them and use them I had to learn how to wash them. It seems that every cloth diaper user has their own system. I went with the one that seemed the easiest. Amelia told me to run them through a cold wash first, then a second wash with hot water and soap. I use an regular detergent like All’s Free and Clear. Washing them is easy and it isn’t too dirty to touch the diapers, because they have newborn poo which isn’t that gross. What is gross is leaving them too long before washing them. I got sick one weekend and went a few days without cleaning them. One fitted diaper grew fuzzy mold. After that weekend when I went to wash them I let the diapers soak in the washer over night in cold water. Then I ran them the next morning. When I took them out of the washer a few diapers had black mold spots. Either they grew from the soaking or from me waiting too long to wash them. I tried oxi-clean and even bleach, but the mold spots never came out. Sometimes the diapers come out stained with yellow spots, so I sun them. All I do is hang them outside in the sun and the stains go away. (Those are my diapers in the photo.) I have no idea how this works, but it does! They come back to being perfectly white. Is Cloth Diapering Working For Me? I am currently cloth diapering about 50% of the time. I may not be 100% percent all the time cloth diapering, but I still feel like my 50% makes a difference on the environment. My husband changes my sons diapers during the night and in our sleep deprived state I didn’t want to make him change a cloth diaper. Also, I think I may not have enough cloth diapers, because I need to wash them every other day to keep up. I am not very good at washing them often. Also there are some days where I am super busy and overwhelmed so I don’t want to mess with them. We were given many disposable diapers as gifts as well, so I haven’t had to spend any money in diapers for my 7 week old son yet. I think when I have to spend my own money on diapers I will be more intent on cloth diapering more often. How about you? Have you tried cloth diapering? What were your first few weeks like? Are you like me and always wanted to, but never wanted to spend the money to start? For her second birthday, my daughter Lucy received a video: Bear In the Big Blue House, and it was all about potty training. Over & over we’d watch it, and I had all the suggestions and songs memorized. 11 months ago, that marked the start of potty training in our house. Looking back, I can see that while it may have taught Lucy a thing or two, it was probably a little soon. She saw the video as entertainment and showed no signs of being ready for a potty. Every now & then over the past year, she’d sit on her little potty, but only sporadically would she go. There were times I thought she was ready, only to find out it was a little phase of interest. She was still filling up diapers on a regular basis and never talked about the potty. We incorporated all kinds of incentives, like stickers and candy. Still, she would never initiate the process. It took all kinds of urging. To my relief, about a month ago, Lucy started telling us that she wanted to go. This was a huge turning point. At Christmas, when my mom was visiting, I said, “Oh, it’s going to be so much work.” I was referring to the dozens of times we’d be in the bathroom each day, going through the whole routine, washing our hands. My mom said, “It’ll be hard at first. Then it’ll start to get easier.” Between Christmas and New Year’s, I had a whole week at home with Lucy, so I knew it was time to get it done. No more excuses. I removed all of Lucy’s diapers. I figured, if they’re not there, we won’t use them. Time for underwear all the time at home. Pull-ups for naptime, bedtime, and for away trips. I remind Lucy to use the potty about every 15-30 minutes. Some people set timers for this. I tried that, but it wasn’t necessary. I’m a good nag. If she hesitates, I’ll remind her of a sticker or candy (or both) as a reward. Sometimes that works. Sometimes it doesn’t. Sometimes she is willing to go. Sometimes she isn’t. The more I nag, the less interested she becomes. So I try to remind her in moderation. I repeat the same phrases so they became a part of her vocabulary. “I have to go potty.” “Keeping my undies dry – that is the goal.” “Now is a time to hold it.” “Only babies go pee-pee in the car.” “I’m so proud!” “I did it!” I sing songs about these things before, during, and after. She sings them too. One time, I knew she had to go, but I didn’t say anything. I just shut up and watched her. About a minute later, she got up by herself, didn’t say anything, and went to the bathroom. Once, she left the room to take care of her business in the middle of watching a video, which was shocking to me. Success!! I use anything as an incentive now. If she brings me a book to read, I’ll say, “I’ll read this to you right after you use the potty.” If she asks for a cup of milk, I’ll say, “Go on the potty and you can have some milk right after.” Done. She’s peeing. I remind her to brag about her accomplishments to everyone who’ll listen: Daddy, her pre-school teacher, her friends, my friends, etc. This garners so much praise for her that she stays motivated. A couple of days ago, for example, she went 3 times at her friend’s house during playgroup, twice self-initiated. I emphasize how much better underwear feels than a diaper. 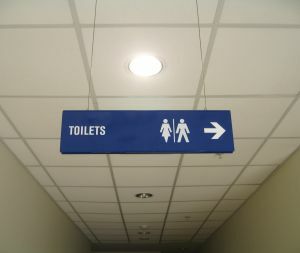 The challenge for us now is transitioning to full-time potty usage at other places. We’ve got it down at home pretty great – what about car trips, visits to church or friends’ homes, and pre-school? (Not to mention overnight!) I’ll be trial-and-erroring it in all those situations. Little by little, she’s making up her mind that underwear is better than diapers/pull-ups. I can see that we’re almost there – and I’ll be so relieved when it’s behind us. I realize that there is a lot of information available about potty-training, and I just wanted to share a bit of our story today. What are your potty-training success stories? Is this the worst part of raising toddlers (it ranks down there for me, because of the energy it requires)? Any tips or suggestions for the transition to staying dry everywhere? As someone who likes to live Green (I have much higher hopes that I will one day do much better than I currently am doing), I was recently challenged to try a new way of living. Going paperless. That’s right, no disposable papers in the house. Wipes, toilet paper, diapers, paper towels, kleenex, napkins, menstral pads and tampons….But one thing at a time. It is overwhelming to try and do it all at once. We have pretty much been paper towel-less for a few years because we were given 2 bags of microfiber cloths from Sams. I pretty much use those for EVERYTHING. The only thing I use paper towels for is to make bacon in the microwave. It was an easy transition for us. I also started using the Diva Cup a few years ago and have enjoyed that. Disposable menstral pads drive me crazy and irritate my skin and I don’t like the idea of using chemical products “up there.” I haven’t tried cloth menstral pads yet but I would like to try them as a back up to the Diva Cup. We have posted before about cloth diapers and the benefits but there are many other things we also can do to reduce our waste. I realize that this post will probably elicit verbal noises from you while you read it but it should make for an interesting, and hopefully not revolting read for you. I recently read a post from another blogger who has decided to cut down on her toilet paper use by using cloth wipes instead. out going toilet paper-less. One woman has a great post about what her family does and how her toilet paper-less system works (a lovely basket that holds clean pee wipes, a wipes warmer for clean poop wipes, and a dirty wipes bag). She does keep a roll of paper t.p. on hand for guests who feel uncomfortable using the cloth wipes. I have to admit, I was inspired. Why use scratchy toilet paper when you can use soft flannel or cotton? Why pay for something that can be washed and reused? I can use a small trash can with a lid to put the dirty cloth wipes in between washes. I could probably get a wipes warmer from Freecycle or Craig’s List. I think cloth wipes are more effecient no matter where you are wiping. I use fewer cloth wipes than disposable wipes when changing a dirty diaper. It might take a bit to get over the whole big kid/grown up poop thing…but how much different is it than using cloth diapers and wipes on babies and toddlers? Not much, really. And I have seen a lot of poop over the past 5 years. We already use cloth diapers so what is a few more wipes to the laundry? 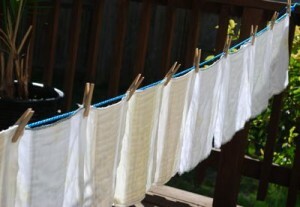 Making your own cloth wipes for baby bums or your own is not very expensive at all. All you need is some soft flannel from the fabric store and a sewing machine. You can read about how to make your own here and here. The latter tells you how you can make your own by reusing all those extra flannel receiving blankets you got from your baby showers. I am not much of a sew-er but I can definitely do that! When I told my husband about my new inspiration he gave me “that look” that said, WHAT?! Really? And then he said, “Um, can we talk about this later? I think I need a little more time to digest another crunchy idea of yours.” So, he’s digesting and I am formulating how many wipes I think I will need to supply our family bathroom habits. I don’t know how much toilet paper your kids use but now that mine wipe themselves, we go through toilet paper like crazy and I am not too fond of jammed toilets. I’m all for saving pennies–and time not spent unclogging the toilet. My thought it that it might be a little extra laundry but the “nether-regions” of my family will appreciate the softness of the cloth toilet paper and I will enjoy not spending so much money on toilet paper at the store. Just for fun, I also came across this: The Biffy. When my husband saw that you could have your own personal toilet bidet he said, ”No way are we getting one of those!” I don’t see myself purchasing a Biffy anytime soon. So, any thoughts? Anyone want to join me in the change over from toilet paper to cloth toilet wipes? Tell us if it grosses you out or if you think it is something you might consider doing!